I have to say I had fun with this painting. Perhaps that was inspired by these adorable babies at a nearby llama farm. I'd stopped to take some pictures of chickens and the owner came out. He told me he thought I was looking for the "babies." Then, I saw them - five of them, and were they cute! Doesn't it look like Cleo (the one on the left) has things to say to Alex? He's listening with one ear up. 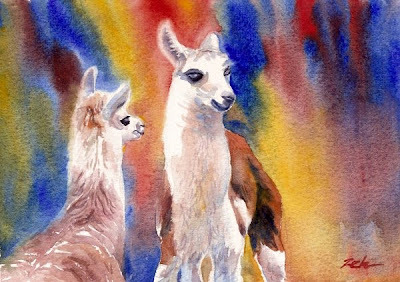 The background colors imply sunlight streaming through the trees and make me think of the bright colors of South America, where llamas originate. Found this browsing for llamas. Just wanted to say that this is incredible! Awesome work. Thank you. It is a fun painting. I really like llamas and would love to have some myself.